Three years ago, there were rumblings about the New York State Grade 3-8 ELA and Math exams. As the parent of a fourth grader at the time, I listened to my son come home from school with hyper focus and worry about the tests. 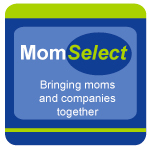 TechyDad and I did a lot of research and at almost the last minute, we made a BIG decision. 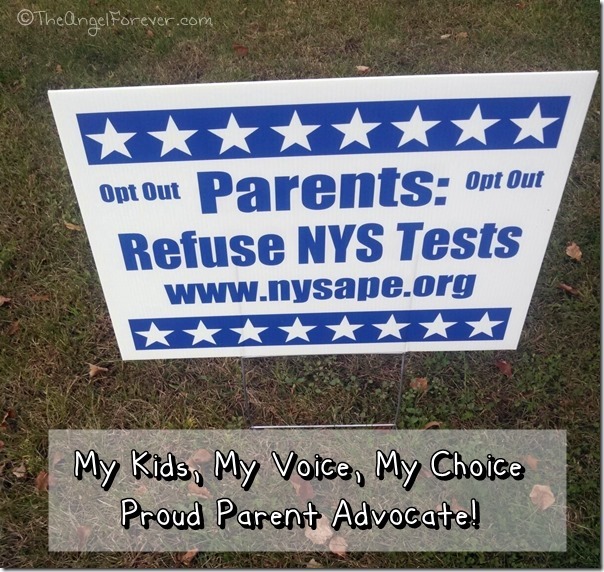 Yes, we refused the NYS tests for our oldest son. I have written about this topic numerous times over the last few years. As a teacher, I knew that these posts and my advocacy within the community could mean never teaching again. While it hurts to think of never being in a classroom again, my boys and their peers across NYS and the United States need people to speak out. 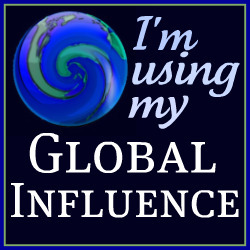 We need to get the word out about the drastic changes in our schools. A generation of kids are being used to test educational practices thought up by people who do not have a background in teaching or child development. I can see drastic changes in the scope of learning between my seventh grader and third grader. Being naïve, I thought that I would never be here refusing the 2016 tests for both of my kids. My heart was hopeful that by the time my youngest hit these tests that something would change. Much to my horror, little if anything has really changed. This is a fact that those with kids in schools know. Do not be fooled by the new Commissioner of Education in NYS, MaryEllen Elia, or the puppet master general, Governor Cuomo. The Common Core Task Force in NYS is a farce put together to pretend to listen and pacify angry parents. Pearson was fired by NYSED over the summer of 2015, but their test will be given this spring to those that do not refuse. In an attempt to quiet parents, Commissioner Elia has put no time limit on these developmentally inappropriate tests. Now kids can sit and feel like failures for an unlimited amount of time while they work on tests that many with advanced graduate degrees can not complete or make sense of. Last year, approximately 250,000 kids across New York refused to take the grade 3-8 tests. Those in the advocacy networks are hopeful that half a million will refuse in 2016. The stakes are higher for many schools under the trapped Receivership System. If all refused these faulty tests the data could not be used against teachers and schools that are struggling with the reality of poverty and so much more. So when will we opt back into the tests? Thanks to NYSAPE, this sums up most of my views pretty nicely. I urge you to take the time and ask questions. Do not simply sit back and accept tests just because they are given. This is not about tests that or too hard and kids not being up to a challenge. This is about so much more and our children are the ones that will have to pay the ultimate price. I need advice. I went to local library panel discussion last week, because I admit I had my head in the sand. My husband believes our only daughter should practice test taking to be ready for SATs. My daughter says she enjoys taking tests. It was night meeting day 2 of ELA and after meeting I was dead against but my family would not be convinced until over the weekend my daughter caved in. So Monday morning comes and I am fumbling around for form to print a form letter. 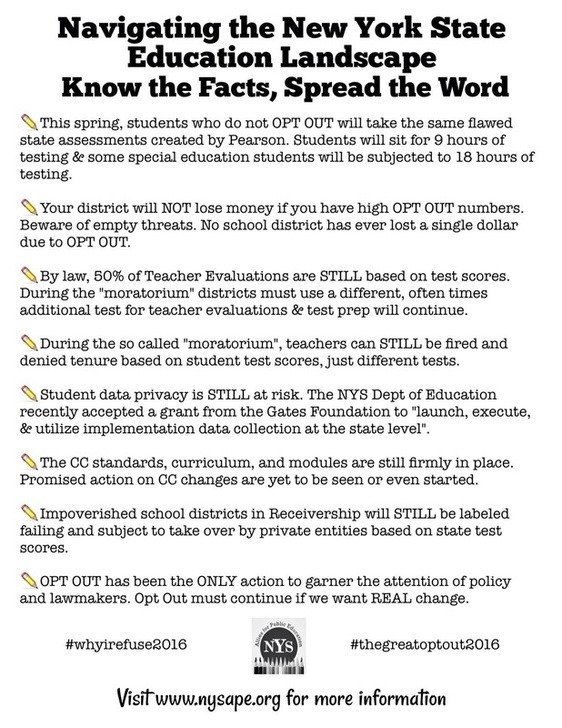 I printed Opt Out 2016 with the Teacher’s name and a laundry list of blanks. I am perplexed so the only thing I check is the Math. Explain to me what would have happened if I did opt of day 3 ELA? Would my student-daughter have gotten a zero for all days? Were the other choices on the form equally important?